The TD First Class(SM) Visa Signature® Credit Card is a great option for those looking to earn rewards from nights out on the town or when hopping on a plane, train or automobile to take a trip. Prospective cardholders can earn 3x miles on all eligible travel and restaurant purchases, including airfare, hotels, car rentals and cruises, along with meals at fast food restaurants or when dining at high-end restaurants. Other transactions made with this card, earn 1x miles. The first purchase during the first six billing cycles with the TD First Class(SM) Visa Signature® Credit Card will result in an addition of 15,000 reward miles. Another 10,000 miles will be thrown on top of that should the cardholder spend at least $3,000 in net purchases (purchases minus returns/credits) throughout the duration of that six billing cycle period. The APR on the TD First Class(SM) Visa Signature® Credit Card is 15.49% Variable -- an extremely solid rate even without the benefit of an introductory APR. There’s no annual fee for the first year, along with a 0% intro APR on balance transfers for 12 billing cycles. Those features makes this card an extremely attractive option for those who need to transfer debt and, therefore likely don’t want to pay a lot up front. Multiply your miles earnings - The TD First Class(SM) Visa Signature® Credit Card gives cardholders 3x miles on eligible travel purchases -- flights, hotel stays, car rentals and cruises -- and when spending at eligible restaurants. Cardholders will earn 1x miles on all other purchases. Bonus mileage - Cardholders can earn up to 25,000 extra miles during the first six billing cycles from their account opening date. When a new cardholder makes their first purchase during this time, they’ll earn a one-time bonus of 15,000 miles. An additional 10,000 miles can be earned by spending $3,000 in net purchases during the first six billing cycles. These totals will be reflected in the cardholder’s account six to eight weeks after the above date has passed. No annual fee for first year - The TD First Class(SM) Visa Signature® Credit Card has a $0 annual fee during a cardholder’s first year with the card. After that the annual fee will be $89. 15.49% Variable APR on purchases - All cardholders of the TD First Class(SM) Visa Signature® Credit Card will receive a 15.49% Variable APR. 0% introductory APR on balance transfers - New cardholders can make balance transfers with a 0% introductory APR for the first 12 billing cycles. This rate will follow the purchase APR after that time to 15.49% Variable. Miles can be used for rewards - TD allows multiple ways for cardholders to use their mileage for rewards, but there’s no direct cash back option available. Adding two zeros to a purchase amount determines how many miles are needed to achieve that total. For example, a $200 purchase would require 20,000 miles. Travel - Miles are able to be redeemed for airfare, hotel stays, car rentals and more. Restaurant visits are also covered by miles earned through the rewards program. Brand-name merchandise - Cardholders can visit TDBank.com/FirstClassRewards to choose and purchase gift cards and merchandise from brand-name companies. 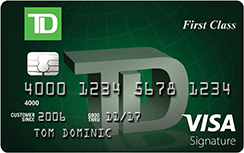 Statement credit - TD lets cardholders to redeem their miles as a statement credit to help pay off their monthly bill. If the cardholder has built up at least 25,000 miles, they can be redeemed at full value for this option. However, should the cardholder have accumulated less than 25,000 and also made no travel or dining purchases recently, then they’ll receive just 50% of the full value of their miles as a statement credit. No foreign transaction fee - There are no foreign transaction fees, like most travel-centric credit cards. Lost luggage reimbursement - If the cardholder has paid for their entire trip fare with the TD First Class(SM) Visa Signature® Credit Card and their luggage is lost, they’ll be reimbursed for up to $3,000 ($2,000 for New York residents). Travel accident insurance - Covers the cardholder and their family for accidental death or dismemberment when traveling either by air, or on water or ground. This also covers cardholders during their transportation to and from the airport, as well as in between terminals. Travel emergency assistance - Cardholders will receive aid over the phone when in an emergency situation while traveling. Visa® will contact local emergency services to help the cardholder. Auto rental collision damage waiver - This covers rental vehicles of the cardholder in the event that it is damaged or stolen. The claim must be reported to Visa®, as they will act as the liaison between the rental company and cardholder. The entire purchase needs to have been made with the TD First Class(SM) Visa Signature® Credit Card for this to apply. Roadside dispatch - This is a $59.95 service that will help cardholders with 24/7 roadside issues like tire changes, tows and fuel delivery. That price includes a tow of up to five miles or a lockout service. TD Visa Signature® benefits - Visa Signature® members receive a few extra perks to make their travels more comfortable and enjoyable. Free phone concierge - This is a 24/7 phone service that helps TD First Class? Card holders do travel research, including buying admission to various events, or aiding them in finding places to go and things to do. Luxury Hotel Collection - Cardholders will be eligible for daily price reductions and deals on various hotels in different places around the globe. These discounts also cover dining experiences, shopping, events and car rentals. Consumer protections - Visa® offers some buyer protections for items fully purchased with the TD First Class(SM) Visa Signature® Credit Card. Purchase security - If the cardholder paid for an item totally on their TD First Class(SM) Visa Signature® Credit Card, they’ll be covered if that item is damaged or stolen within the first three months after the purchase date. This benefit will either replace, repair or reimburse the cardholder with a maximum of $10,000 a claim and $50,000 a cardholder. Warranty manager service - Visa® cardholders are eligible for this service that helps members manage, redeem and extend the warranties of any items purchased with the TD First Class(SM) Visa Signature® Credit Card. This lengthens the item’s manufacturer warranty up to one year on warranties three years or less. The maximum benefit per claim is $10,000, with a max of $50,000 per cardholder. Visa® Zero Liability - Cardholders are completely protected from any unauthorized use of or access to their TD First Class(SM) Visa Signature® Credit Card. If an issue arises involving this, members can call the 24/7 Credit Card Customer Support line at 1-888-561-8861. Free credit check - TD First Class? Card members receive free access to their credit score from VantageScore®. This is also joined by a set of free credit score tools for cardholders to use to make sure that they’re maintaining good financial habits. To access your score, you must enroll in TD Bank personal online services and accept the online banking service agreement. Your personal information on your TD account and credit file must match. The TD First Class(SM) Visa Signature® Credit Card is clearly made for those who dine out and travel often -- both for vacations and business -- and typically fly to get where they’re going. The 3x miles available for the above two categories make the possible rewards extremely valuable, as those miles don't expire and there is no limit to how many you can earn. The first purchase with the TD First Class(SM) Visa Signature® Credit Card during the opening six billing cycles will award cardholders with a one-time 15,000 mile bonus. If the cardholder spends at least $3,000 in net purchases during that same time period, they’ll earn an additional 10,000 miles. That makes this card an especially good choice for those who are planning a vacation or other large purchase immediately after getting approved for the TD First Class(SM) Visa Signature® Credit Card. This is also a fantastic option for anyone looking to make a balance transfer. The 12-billing cycle 0% introductory APR allows cardholders to transfer debt without the fear of further increasing that dreaded number. To redeem miles -- whether for a meal at a restaurant down the street or for a 14-hour flight to Asia -- put the purchase on your TD First Class(SM) Visa Signature® Credit Card. Then, call the TD Rewards Center at 1-888-468-3178 within 180 days of the charge and TD will apply your mileage credit to that purchase on your monthly bill. Following the first year, the card’s annual fee is $89, which may be a turn off for some. If, for any reason, your TD card account falls out of good standing -- including situations of bankruptcy, a “serious delinquency” in making monthly payments, misuse or fraudulent use of the account -- then your miles earned during the life of your account could be forfeited. Also, if the account is closed for any other reason, either by TD itself or the cardholder, then those same miles are forfeited if they haven’t been redeemed within 60 days of the account shutdown. Any returns or credits returned back to the TD First Class(SM) Visa Signature® Credit Card will reduce the amount of miles received for that purchase by whatever amount is sent back to the account. Miles also cannot be redeemed as a direct amount of cash, with the closest alternative being an account credit that cardholders can use to pay off their monthly bill. Mileage is earned by TD First Class? cardholders by making eligible travel and dining purchases for 3x miles, while all other transactions will receive 1x miles. Cardholders can also earn 25,000 bonus miles during their first six billing cycles with the TD First Class? Card. The first purchase a cardholder makes with the card will trigger a 15,000- mile bonus, with an additional 10,000 miles able to be earned after they’ve spent $3,000 in net purchases during the above opening period. Miles with the TD First Class(SM) Visa Signature® Credit Card don’t expire and there’s no limit to how many you can earn and save up -- making it so cardholders can use their rewards when they need them most. Cardholders of the TD First Class(SM) Visa Signature® Credit Card will receive an introductory 0% APR for balance transfers. So those looking to make a balance transfer immediately will have success with this card. After that initial 12 billing cycles, the APR for the TD First Class? Card will raise to 15.49% Variable. 15.49% APR -- This APR will vary with the U.S. Prime Rate. 0% introductory APR for 12 billing cycles. Following that, the APR will be 15.49%. This APR will vary with the U.S. Prime Rate. While part of the TD First Class(SM) Visa Signature® Credit Card’s appeal lies in the simplicity of earning rewards with it, other similar travel-centric cards have some extra flight-related benefits to them. This is especially true with cards that specifically target customers of a single airline. The TD First Class(SM) Visa Signature® Credit Card is a solid choice for travelers looking to gain rewards miles for their consistent traveling and dining out. 3x points on eligible travel-related and dining purchases, paired with 1x points on all other buys with the TD First Class(SM) Visa Signature® Credit Card makes for a straightforward rewards system card that makes earning miles easy for cardholders. The first buy with the card will credit the cardholders’ miles account with 15,000 miles, and at least $3,000 in net purchases during the first six billing cycles earns another 10,000 miles. A 15.49% Variable APR and 0% introductory APR for 12 billing cycles on balance transfers gives cardholders the added benefit of low risk associated with the TD First Class(SM) Visa Signature® Credit Card. It is worth remembering that after the first year, there’s an $89 annual fee – you’ll have to decide for yourself it the card’s perks are worth that fee.